I don't have a sketch this week. It's getting to be that time of the year where there are barely any spare moments. However, I saw this amazing card by Laura Bassen, and I was inspired! I wanted to see what I could do using a few dies and punches. I created my main panel by running white card stock through with a star die. I did this 5 times, moving the die to achieve the desired placement. I wanted a few more stars, so I used a star punch. I wanted a colourful background to show behind the stars. I blended Mustard Seed, Spiced Marmalade, Ripe Persimmon, Barn Door, and Fired Brick. 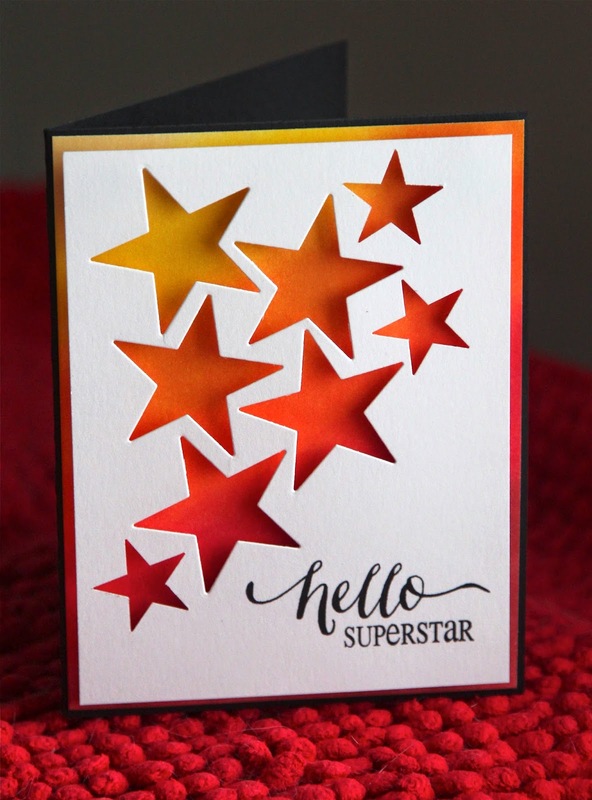 I stamped a combination greeting using the hello Wplus9 and the superstar from a Verve. I popped up the starry panel using thick foam tape and then placed that on a black card base. I was totally thrilled with how it turned out. If anyone is interested in seeing a video of any of my cards or creative process, please let me know!